Welcome to the future, you are only dreaming in the year 2013… It seems to be the self police parade as well these days with Hawkwind offshoots calling themselves near-copyright infringement names next to the real deal Hawkwind. 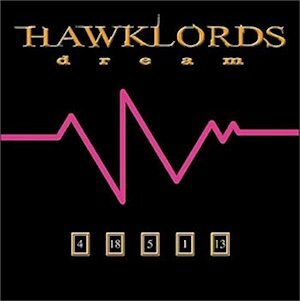 While Hawklords have had a couple of members in past lineups to semi-justify their name, namely Harvey Bainbridge and Steve Swindells from the 25 Years On Album roughly 35 years ago, to say I initially was not very thrilled when I heard the first CD of this new “Hawklords” band last year, called We Are One, is not a mild statement. I thought it sounded like a bad punk record I had heard a million times over. So I shelved it and after a few months checked it out again, and went “wow!” and thought “this is some good rockin’ old fashioned Space Rock!”. It had no real sound that brought it closer to the original 70’s bands electronic ambience or mellow new wave aesthethics though, and there was no Dave Brock or Robert Calvert involved, obviously. Though also having past Hawkwind members like Ron Tree (vocals), Jerry Richards (guitar) and Adrian Shaw (bass) onboard, they really are a different entity. Especially now that Steve Swindells seems to have left the band, leaving only Harvey as the sole original “Hawklord”. Additionally on Dream we seem to have Paul Hayles now guesting on one track, being the man from The Sonic Assassins ’77 band and the recent Lastwind (whose sole album from a few years ago is rather excellent)! Which brings us to 2013’s Dream. Much like its predecessor from last year it chugs along rather nicely, but now interspersed with a few “dreamier” mellow tracks scattered throughout the CD. For those who like this sort of head-on spacerock no matter which Hawkwind camp it is from, and crave more, go ahead and get it, you won’t be disappointed. I am not so sure Dream fulfills my Spacerock Destiny as any better than We Are One. I even find it slightly weaker than the first effort. Stand-out songs are the opener, Dream A Dream, and the track Elemental Mind which seems to borrow a lot melody-wise from Hawkwind’s song Hippy, the punky Nowhere Everywhere, and the progressive-psychedelic closer Psychic Eyes, which clocks in at 7 minutes. If you are seriously demented, this album is also availible on silver vinyl!